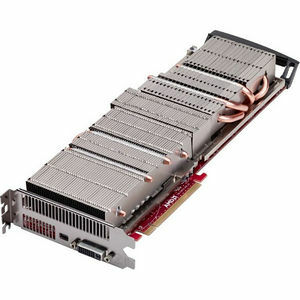 AMD FirePro™ S10000 Passive is a powerful server card designed to meet the performance requirements for both GPU compute and enterprise virtualization deployments. For clusters and supercomputers leveraging the power of GPUs, the S10000 Passive delivers good performance per watt, up to 5.91 TFLOPS of single precision and up to 1.48 TFLOPS of double precision floating point performance. For data center mangers looking to virtualize applications and remotely power desktop experiences to users from the data center, the S10000 Passive is compatible with leading hypervisor technologies from Citrix, VMware and Microsoft, features 6GB of memory and AMD RapidFire technology to ensure low latency, high performance computing experiences, and its dual-GPU design helps to maximize deployment density.